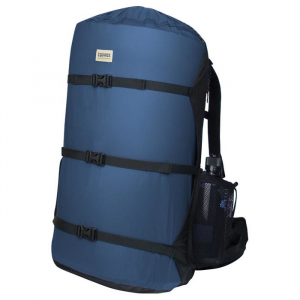 High Sierra’s Karadon 55-liter backpack features an innovative, fully adjustable torso and waist belt. 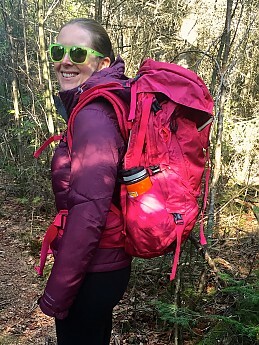 This design seems ideal for growing adolescent hikers, families with multiple children, or anyone on the market for a pack that is likely to fit a variety of body shapes and sizes. 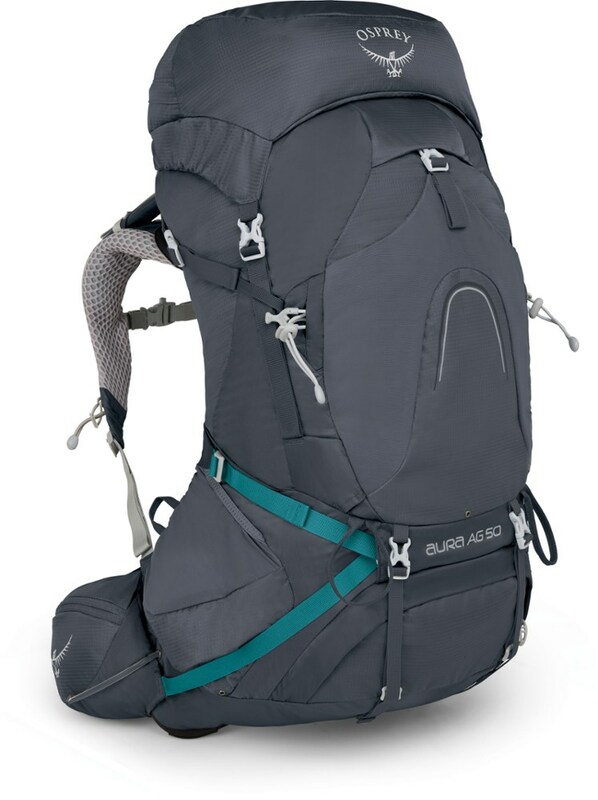 However, if you’re an experienced backpacker looking for a high-end pack designed for your specific body type, move on; this is likely not the pack for you. 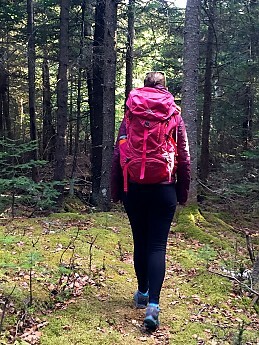 I tested the Karadon 55-liter pack from mid-November 2015 through April of 2016 in and around the White Mountains of New Hampshire. My initial thought in testing the Karadon was that I would use it alpine ski touring over the winter. Unfortunately, snow largely evaded the Whites this season, limited my backcountry ski excursions to a single sad trip up a tiny local ski hill. A 55L pack wasn’t exactly warranted in these conditions. So, I begrudgingly left my skis in the shed, testing the Karadon over a course of day hikes. 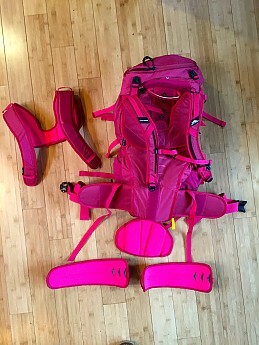 I will note here that the pack is likely best suited for overnight backpacking trips. I’m not one for winter camping, but if provided the opportunity, will plan to update this review once the weather warms enough to take it out for a backpacking excursion. A defining feature of the Karadon is the adjustable torso. 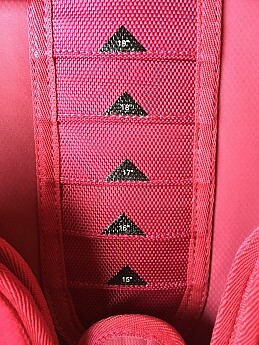 On the women’s small-medium 55L the torso ranges from 15" to 19" (medium-large is 18" to 22"), by 1" increments. 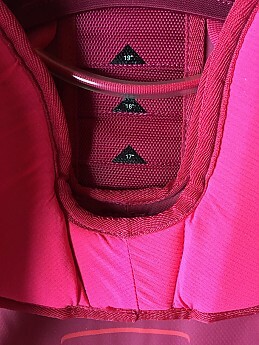 As shown in the pictures below, the torso length is easily adjusted by securing the tab in the appropriate slot. When I first used this feature I was concerned that the curved shape of the tab would result in the torso wiggling back and forth as I hiked. However, I was pleasantly surprised to learn that once set to a specific torso length it sits securely. 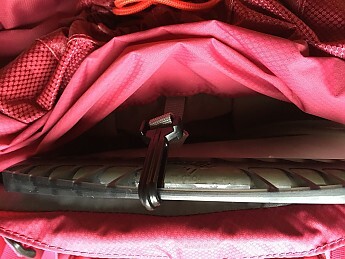 When I put the pack down the tab tends to slide out, so before putting it back on after a break on the way up the trail or some relaxation at the summit, it’s generally a good idea to check that the tab is in place before hoisting the Karadon onto your back. 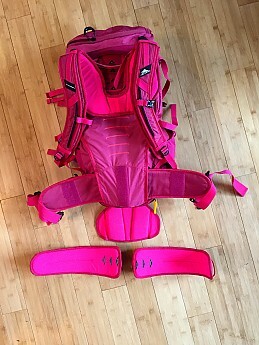 While the adjustable torso is not a feature likely to be popular among avid adult backpackers (who know their torso length and are unlikely to grow or shrink over the course of a pack’s lifetime), I love the applicability of this feature for families with kids, outdoors-based camps or schools, or even intro level backpackers who may appreciate being able to play around with various torso length settings before landing at a measurement that is ideal for their shape. Due to the adjustability in torso length, both the men’s and women’s versions of the Karadon come in only two sizes: small-medium and medium-large. I tested the women’s small-medium and it fits well. 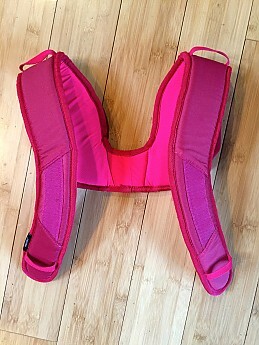 The waist belt, sternum strap, and load lifter straps are all highly adjustable. 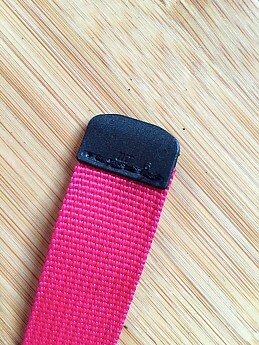 The sternum strap includes a slide, which allows it to be moved up or down as needed. 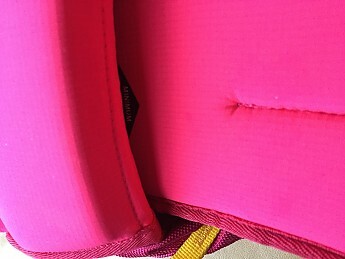 The waist belt pads are completely removable and can be let out or taken in by about 3 inches on each side. 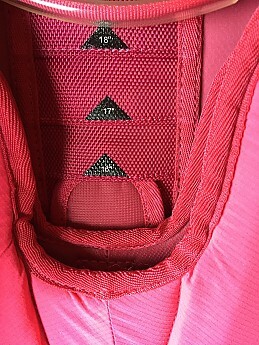 Two Velcro panels secure each side of the waist belt, holding it in place securely. 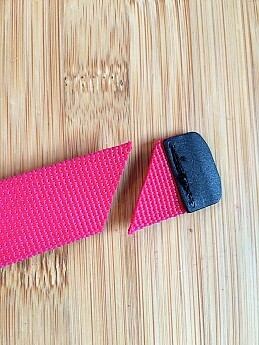 Depending upon the frequency of adjustment, the Velcro could lose its staying power over time. However, I’ve had no such issues during this 4 ½ month testing period. I enjoyed the comfort of the Karadon. The padding at the shoulders, lower back (lumbar), and hips is adequate yet not superfluous. 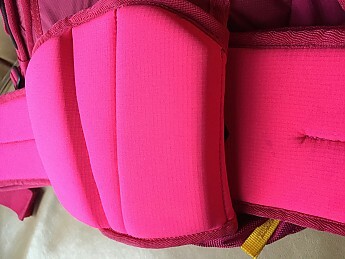 I once used an over-padded pack that was super comfortable at first, but over time the padding itself began to result in hot spots. I didn’t experience any such issues with the Karadon. Having not yet been able to take it out for any overnight excursions, I can’t speak to the comfort of the pack when carried over high mileage trips when packed closed to capacity. If provided that opportunity later this season I’ll certainly plan to update this review. 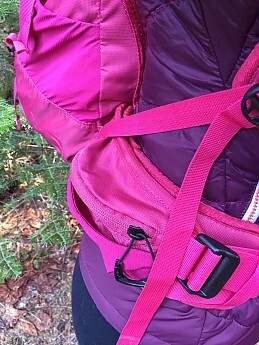 The structure of the Karadon offers padding at the shoulders and low back, which lifts the pack off of the mid-back just enough to offer a bit of ventilation. However, keep in mind that temperatures were cold during the period I spent testing (-5 to 40 degrees Fahrenheit), so the breathability of the pack was not exactly tested to its limits. 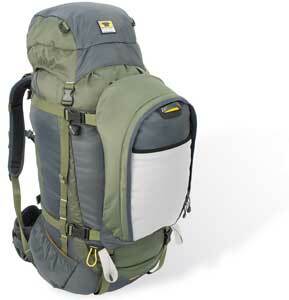 The 55L Karadon easily fits anything I’d need for a day hike or week-long backpacking trip. 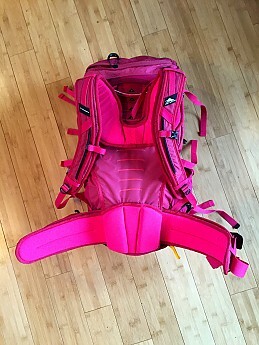 For experimentation’s sake, I filled it with the gear I generally take backcountry ski touring and everything fit well. I appreciate the relatively narrow shape of the pack, which encourages equal weight distribution as I stuff it full of gear. 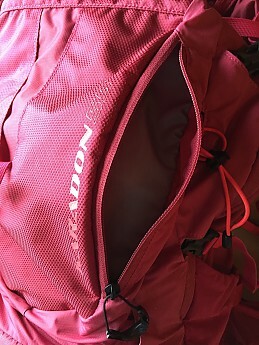 The Karadon also compresses through the use of straps along both sides and the bottom of the pack, allowing gear to fit snugly in place even when the pack is only partially filled. 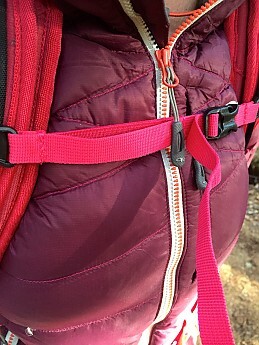 The Karadon includes a front pocket featuring dual side-access zippers (see photo below with an iPhone 6 shown to provide a sense of scale). This pouch easily stores an extra hat, set of mittens, and a Buff. 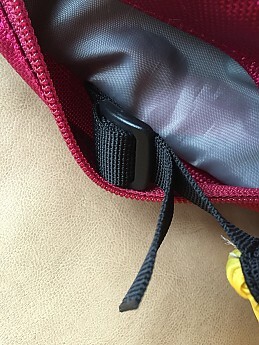 The main compartment can be accessed through a horizontal zipper at the base of the pack, dual-access zippers running the length of the pack, and two drawstring cords beneath the lid. 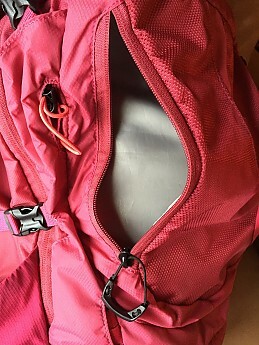 The bottom and side openings allow speedy access to gear anywhere within the main compartment, saving the time and headache of spreading my belongings across the trail as I dig through from the top. 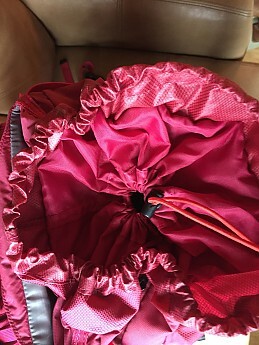 I find the top opening a bit cumbersome- the material surrounding the outer drawstring cord is stiff and difficult to cinch. 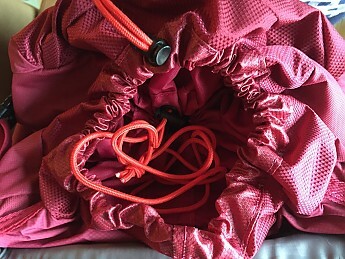 Additionally, I don’t see the need for two drawstrings as they are both covered by the lid of the pack. Fortunately, I was often able to avoid using this opening to access gear while out on the trail due to the bottom and side access points. 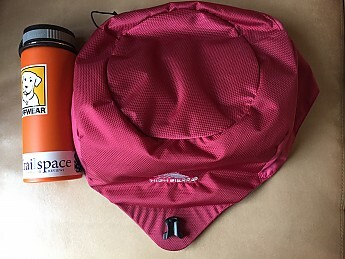 The lid is completely removable—a feature that I appreciate when backpacking as I like to use the lid as a summit pack. 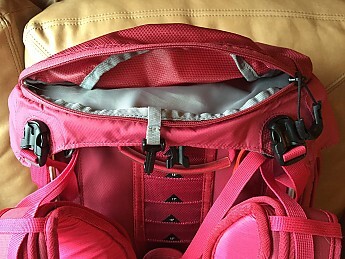 However, there’s no easy way to carry the lid as it does not include any straps. Perhaps it could be a useful toiletry bag for someone staying at a campground or hut. 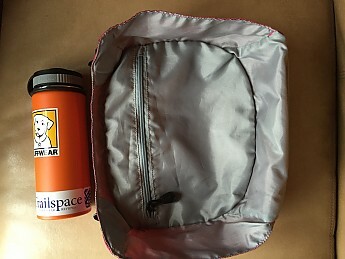 The lid includes two zipper openings- a large one on top and a smaller one on the underside of the lid (as pictured below). The outer opening is easily accessible and includes a clip for securing keys or other such belongings. 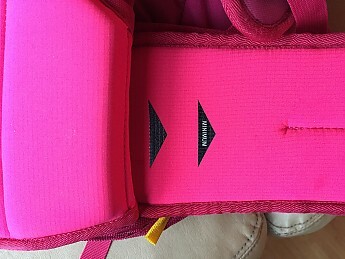 There are two water bottle holders (one on each side), which are pictured below. They are composed of flexible material, holding either my 18oz or 32oz insulated water bottles securely in place (18oz water bottle pictured). 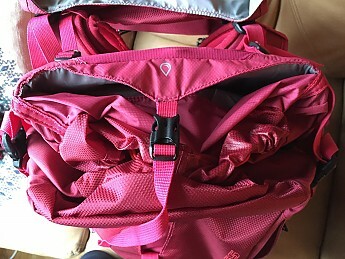 The Karadon also includes a hydration pocket, which is separated from the main compartment and thereby easily accessed. It easily accommodates my 2L bladder and could probably hold a 3L one (although I don't own a larger bladder and haven't been able to test this directly). 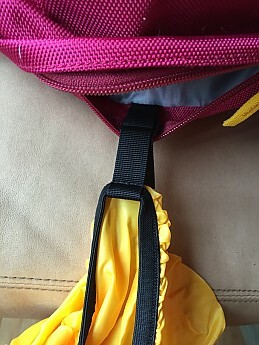 The pack includes a clip for securing a hydration bladder in place. 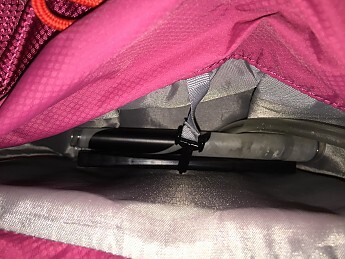 For reasons I can’t seem to make sense of, the clip is secured to the soft side of the bladder reservoir rather than the more sturdy frame side of the pack. As a result, the weight of the bladder tends to pull down on the clip, causing the bladder to sit a few inches down into the reservoir. I haven’t noticed any associated functional difficulties other than having to reach down into the opening in order to retrieve the bladder. There is no dedicated exit point for the bladder line. 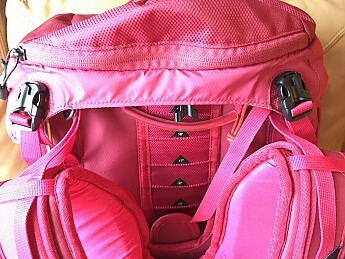 It simply comes out below the base of the pack’s lid and can secure to either shoulder strap through a strip of elastic. 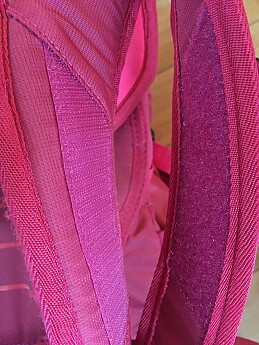 I love the waist belt pockets (one on each side), which include a zipper compartment as well as a flexible, elastic-like pouch. 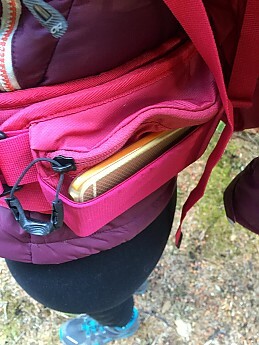 Fitting my phone (which I use as a camera when I’m out on the trail) into the zipper pouch is possible but snug. 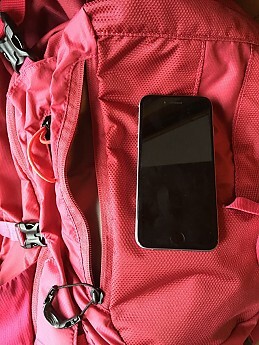 The outer elastic pouch worked out perfectly for me as a phone carrying case, allowing ease of access for quick photo ops while also storing the phone securely when not in use. 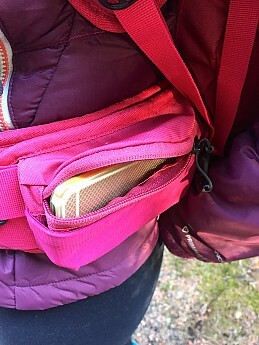 The zipper pouch provides greater protection from the elements, but is not waterproof. 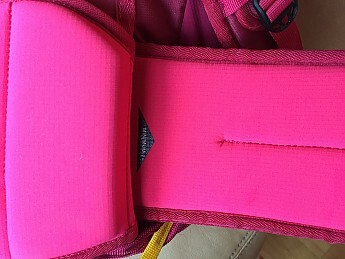 Waist belt zipper pockets (above) and flexible pouch (below) containing iPhone 6 for scale. 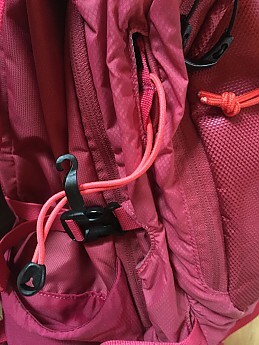 The Karadon also includes a set of loops on each side of the pack and a set of elastic drawcords for securing trekking poles or other such equipment. 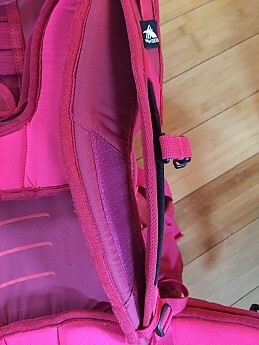 Loop (left) and draw cord (right) for securing trekking poles, etc. 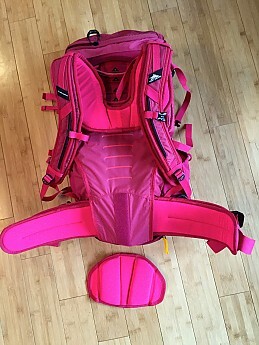 In this review thus far, I’ve discussed the performance of many of the pack’s features, and won’t repeat myself here. However, one general observation worth noting is that the “finishes” leave something to be desired. These features may reflect efforts to cut cost in order to offer a relatively affordable pack. Adjusting the shoulder or load lifter straps is difficult, for example. 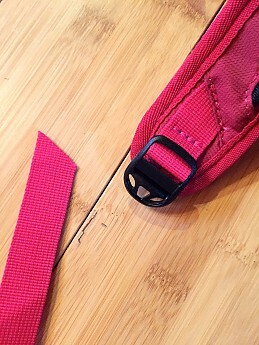 The strap material is durable but feels somewhat inflexible, making fine-tuning adjustments more of a challenge than would be expected as the tension required to adjust the strap often results in more movement than intended. 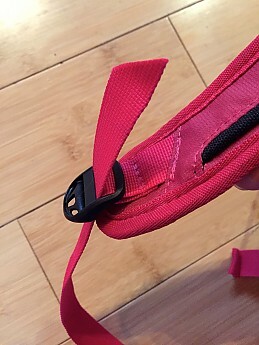 Another strap-related problem is related to the fact that the end of each shoulder strap is reinforced with a stiff, faux-leather like material. 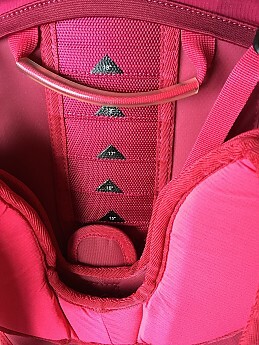 In order to remove the shoulder padding (further discussed under the Features heading of this review) both shoulder straps must be undone. The reinforced ends were so stiff I was unable to pull the straps through the plastic adjusters. 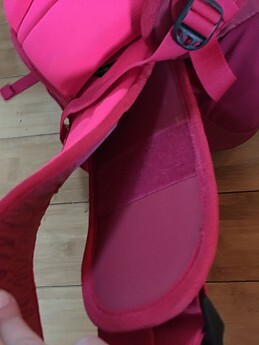 The only way I could disconnect the straps was to cut off the reinforcement material. 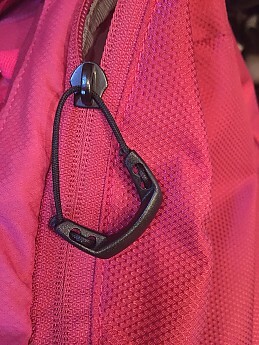 The zipper pulls are larger, and therefore bulkier than necessary, and the top handle of the pack is lined in clear plastic. 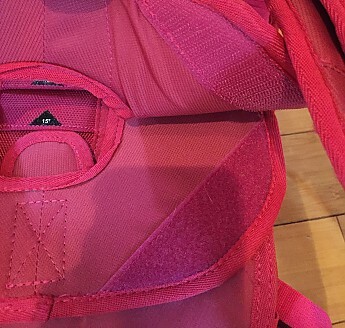 It may sound as though I’m being really picky here, but to me these sort of features differentiate a top of the line backpack from others on the market. In addition to the fully adjustable torso length, the Karadon’s shoulder, lumbar, and waist pads are removable. 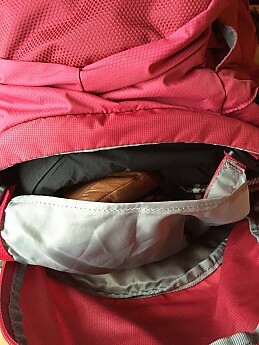 I’ve never before considered washing a backpack…perhaps I’ve grown comfortable with my own stink. 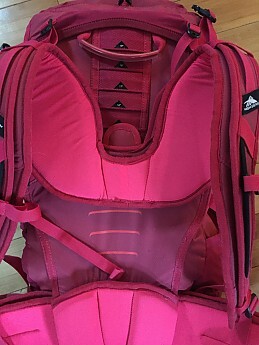 However, considering the possibility that this pack could be traded between users due to the adjustable torso length, creating washable padding is a feature that really appeals to me. 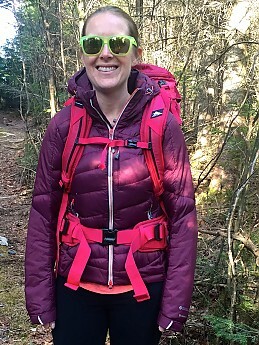 My own stink is one thing, but the stench of another hiker is something I could live without. 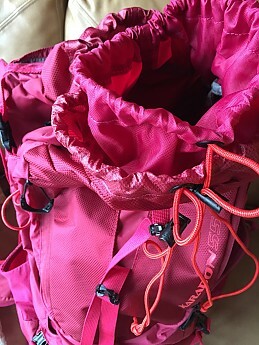 The Karadon also features a rain cover housed in a designated pocket at the base of the pack. I have yet to be caught in a downpour while wearing the Karadon (knock on wood!) but have tested out the waterproofing capacity of the rain cover and it’s certainly not waterproof. It doesn’t leak like a sieve, and overall would probably keep your belongings dry given that the pack itself provides an extra barrier. However, I’d honestly opt for leaving the rain cover at home and packing a couple of trash bags in its place. 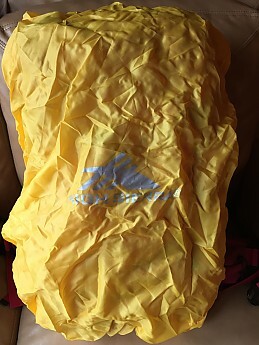 Full disclosure: I’m not a fan of rain covers in general as I feel their purpose is better (and often more inexpensively) served by a trash bag, stuff sack, or some combination. 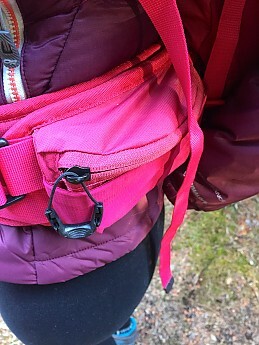 Fortunately for rain cover scrooges like myself, the strap system that connects the rain cover to the pack allows for it to be removed, saving some space and weight on sunny days, or allowing for storage of a trash bag or other gear. 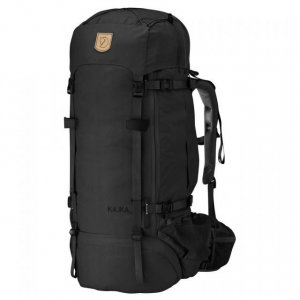 The Karadon seems an ideal entry-level pack, and performs as such. It has a stiff internal frame, offering the necessary support for the Karadon to hold its shape. As I’ve mentioned, the straps and other finishes aren’t top quality in my perspective, but are really only a minor annoyance. 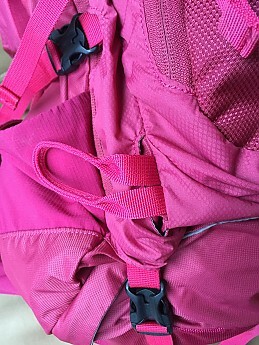 The material that composes the pack itself is nylon. I’ve experienced no tears or other breakdown in the material over the course of testing. All zippers and clasps have also withstood the test of time thus far. 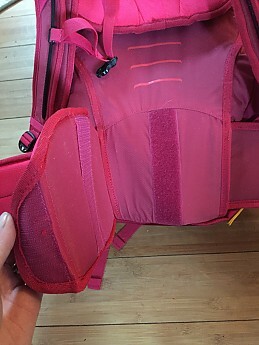 For those seeking peace of mind surrounding the pack's construction, it's worth noting that the warranty on High Sierra packs covers any defects in material or workmanship. According to the website, "if a warranted product fails due to a material or manufacturing defect, we will repair or replace the product at our option." Please refer to High Sierra's warranty policy for further details, but keep in mind that according to the website normal wear and tear is not covered. Available colors include Rose (pink- this is the color of the pack I tested), Jade (green), and Blackberry (purple). Men’s versions come in True Navy (blue), Eden (green), and Carmine (red). Personally, I’m not a fan of pink in general, and am glad to see some alternative color options. 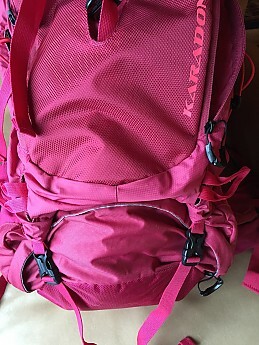 The Karadon retails for $200, a price that seems comparable to other similarly sized entry-level packs. 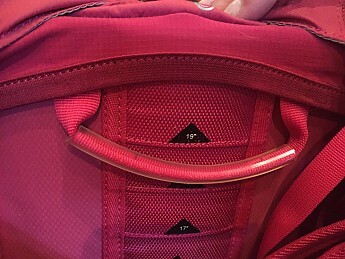 The weight of the pack wasn’t listed on any of the information that came along with it and I can’t seem to find that information listed anywhere online. 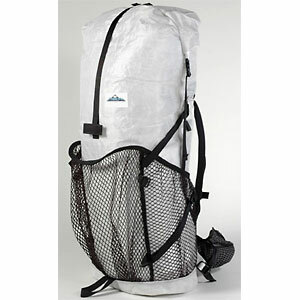 It certainly won’t satisfy the needs of an ultralight hiker, but the pack is fairly lightweight for its size. 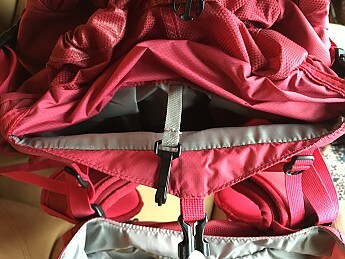 The Karadon features an innovative adjustable torso and waist design, making it ideal for backpackers who haven’t yet finished growing, are uncertain about the most appropriate torso length for them (and wanting to play around with some options), or for families or other groups where one pack may be used by many different hikers. 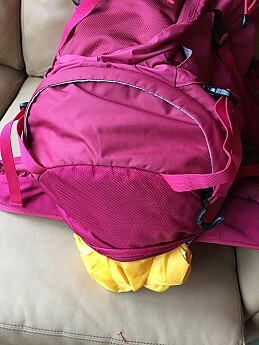 These features are unlikely to be appealing to experienced adult backpackers who know what they need in a pack and are uninterested in sharing. Despite the fact that I consider myself a member of this tribe, I’m excited to see a product on the market that could make backpacking a more affordable and accessible activity and overall am impressed by High Sierra’s execution of this vision. Thanks to the folks at Trailspace and High Sierra for the opportunity to test out the Karadon! Thanks for the review, Kelly. The pink really struck me as stereotyping. Thanks for another helpful, thorough review, Kelly. Thanks Goose! Thanks Alicia! Goose, I'm right there with you on the color, especially given that this pack could be shared between users of different genders. i would wear the pink. excellent review. 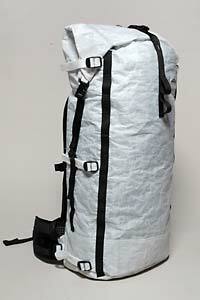 Whats the maximum weight to carry in this pack? 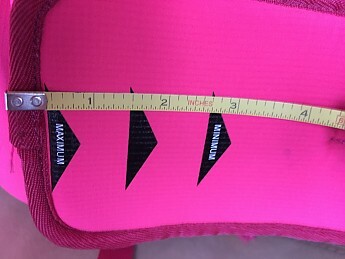 What actual weight did you carry? I don't have exact figures here but I typically try to keep the weight of my pack under 25lbs. 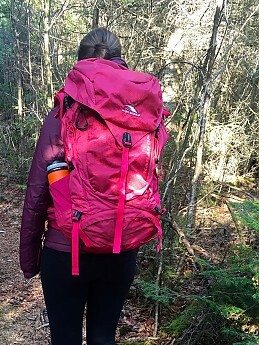 This pack seems to do fine carrying that weight range, however as I mentioned in this review, I haven't been able to test it on overnight trips. As far as a max weight, I find that to be subjective as it depends on the user. That being said personally I wouldn't want to carry more than 35lbs in it. I hope this helps. Great review, Kelly! This is an interesting and thoughtfully designed pack. I bet the back of the pack and the waist gets pretty hot with all of that nylon, though. I may be the odd ball of the group, but I think it looks great in that hot pink color!